Soda Blasting is an amazing technology that has been used in the US for many years initially designed to provide a safe and non destructive method to clean the Statue of Liberty in 1972 and brought to the UK over 20 years ago. clean and removing graffiti, paint, dirt, and many other contaminants without any causing damage to the original surface that needs blast cleaned. 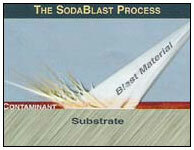 The possibilities are endless when you start to think where Soda Blasting can help. Soda Cleaning has rivals like; grit blasting or sand blasting but soda cleaning does not cause abrasion, sparking or any heat build up to the surfaces being cleaned. When mixed with clean dry high volume low pressure air soda impacts surfaces at 600mph, the soft soda crystals explode and their energy is released removing only the surface contaminants in a very controllable manner. With a professional set-up you can even strip single layers off one at a time. Any other blasting style could remove the underlying media causing irreparable damage.